Being able to listen to what is being said to you is an important pre-cursor to language. Like most skills, this is one that develops over the early years of life from babies who can only focus on one thing for a few seconds to a child of 6-7 who can switch their attention between a piece of work they are doing and the teacher speaking without too much difficulty. We have written more about the stages of attention and listening development in this post if you want to find out more. 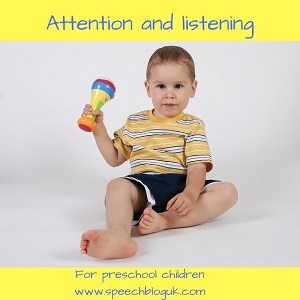 In this post I am going to give you some ideas of how to develop attention and listening skills in a pre-school child. By this, I mean children up to about 4 1/2, though of course some children in this country start school when they are only just 4! At this age I would not expect them to have fully developed skills in this area yet. However, at around this age children are usually able to focus for a while on one thing, and switch their focus from one thing to another and back again without too much support. Start where the child is at. If your child (or the child you are working with) is only able to attend to an activity for a few seconds, don’t expect them to go straight from there to listening for 5 minutes. Start with those few seconds and gradually add a little bit more. For example, if your child will sit and give joint attention to a book with you for 2 pages, try to work up to 3 pages, then 4. Don’t go too fast, we want each level to be consistent before we move on. Use highly motivating activities. Like all of us, children pay more attention to things they are interested in. Use something your child really loves to try to build up their attention span. Let them choose the activity to begin with. Often very multi-sensory toys work well for this – ones with lots to see, hear and feel! Don’t just give your child the toy and let them play – the idea is that the two of you are sharing attention on the same thing. If it is a wind-up toy, take turns to wind it up and watch it go, or see if your child can watch you set it off and request a repeat of the activity. Don’t make it into a battle of wills! Once your child’s attention to the activity has gone, just stop and try again another time. Use visuals. This works particularly for listening in a group (remember that this is likely to be harder than listening 1:1). Use visuals to show the child what is expected (eg a now and next board). For some children a particular spot (such as a certain cushion or carpet tile) to sit on works well. For others using a timer to show them how long they need to sit for can be useful. In any case, give them something visual to focus on rather than just words. Praise. Remember this is really hard. Keep positive and praise the child whenever they try to sit and attend to something with you. Attention levels are likely to be different for activities the child has chosen themselves, activities chosen for them by an adult and group vs 1:1 activities. Remember to set different expectations for each of these situations and gradually build each one up. Start with activities your child has chosen. Whatever they are doing, get down on the floor with them and join in their play, adding something simple to what they are doing. However, eventually they will start to move on to being able to follow your lead sometimes too. Here are some activities that I often find useful for attention and listening. Balls. There are lots of simple games that you can play where before the child can have their turn, or complete the action, they have to wait for you to say go. A ball is just one example, you could also play a game of throwing a beanbag or running. To begin with you might have only a very small gap; basically just wait for the child to look and then say go. For most young children I might also physically hold on to the ball or whatever we are playing with until I say go as well. Once they get the idea, you hopefully won’t need to do this any more. Gradually make the gap longer, then move on to saying “ready steady go”. Gradually wait a little longer each time before you say go. You can find more ideas about how to use a ball to targets all sorts of language skills here. Stacking cups and boxes. This game can be played the same as the ball game described above. Build up a stack of cups or boxes (this bit requires joint attention too). Then say “ready steady go” before the child knocks them down. Once they have got the idea of this, you can add another element in too. Use two stacks of different items this time. Then say “ready steady… boxes” or “ready steady… cups”. This way they really have to listen to the instruction to get it correct. You can do a similar thing with a ball too by saying “ready steady roll” or “ready steady bounce”. Bubbles. You can do very similar things with these. Bubbles are very motivating for a lot of young children and they are great for encouraging children to look at you and getting joint attention with children with a very limited attention span. You can find more ideas of how to use bubbles in therapy here. Books. Some children will naturally sit and look at books. Others need a bit more encouragement. Try interactive books such as ones where you can lift flaps, press buttons to play sounds etc. I even have one book with a hand puppet inside. Don’t worry about reading all the words on the page – to start with, just flip through the pages with your child and point out things of interest in the pictures. Build up to reading the whole story gradually. There are more ideas about using books in therapy here. What else do you do to help build attention and listening skills in preschool children? Thank you for sharing! It was very helpful and it really helped me choose Little Angels.